This week our students got really excited about creating communities in different areas of our forests to stake a claim and create a personal village for each group. 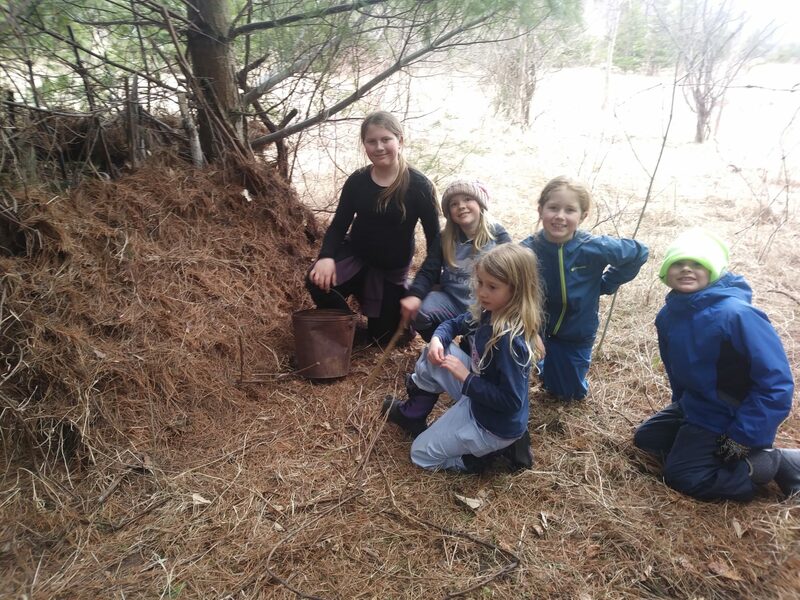 After a quick recap and learning about three basic survival shelters (Lean-to, Teepee and Debris), we chose a place on the map and headed out to let our creations come to life. The groups worked well together creating forts, stores, trading posts, hospitals and much more. The shelters became more than just for survival – they were well landscaped with walls, gardens and benches. We left the forest every day excited to return and add more to these ongoing projects. 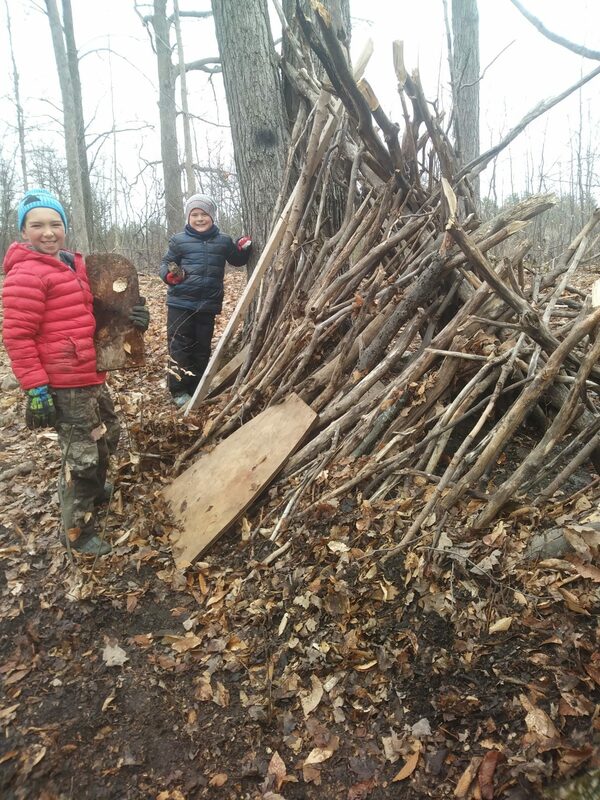 The stories that came to life with the shelter building was paramount, if not more so than the construction! One group even created an entire fantasy world after coming up with the idea of LARPing (Live action role play). Governing rules have been established, challenges created and backstories established for all characters. Stay tuned next week for all the details – we love rolling with child passions as it always leads to incredible adventure and learning. Aside from all that, we were treated with the return of the Trumpeter Swans this week. After connecting with the Trumpeter Swan Society, we know that one of our swans is the offspring of Swan 100 – the first of its kind born in the wild in Ontario in 100 years. A big thanks to the students who carefully took the time and had the patience to find out their tracking numbers! In other news, we’ve also shut down our Maple Syrup production as we were overwhelmed with how much sap we collected this year! We’ve moved on to tapping a small amount of Birch trees (which are at least 80:1 in ratio). 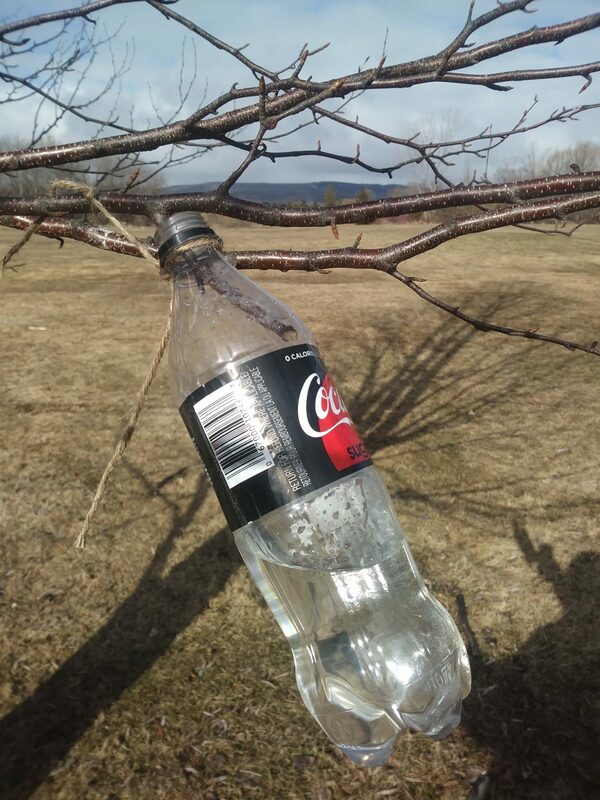 The students from Tuesday have also found another way to harvest it – snip a little branch and attached a plastic bottle. So far, it’s working really well! Previous Post Birds on the Brain!